Normally these missives are written from the “Command Bunker” overlooking the Home Waterfall which is a beautiful setting for a home away from home as close to nature as you can get. But it is almost impossible to be business like in such a distracting environment. For example the other day concentration was diverted by a salmon falling back from the crest of the waterfall. It must have stunned itself on the rocks below because it was then pinned down by two Greater Black Backed Gulls who then devoured it. These gulls often loiter about the house but it is the first time they have been seen in action. 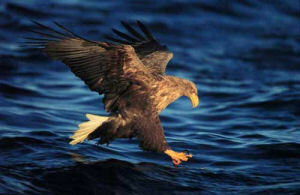 Before the season is over a White Tailed Eagle will be seen soaring outside the window to have a go at the odd “humpy” that is foolish enough to mess about below. At this moment “Yours Truly” is back at Eynsham. It is only for 10 days to sort things out for next year. Please accept apologies for this delayed report and the absence of photographs at this time. Last year our administration was not as smooth as it could have been with a little thought ahead of the Sept/Oct booking season. However, judging by your kind letters so far it has been the happiest season yet. We have a serious problem about what to do with new enquiries for over 200 places to visit the ASR next season so we need to find out who would like to return next year as soon as possible. Also there is the sordid matter of what to do about costs rising over 20% last year largely due to helicopters & fuel with the probability of more to come. The last two weeks have been a huge success. Of course it would have been difficult to go wrong in the week starting 23rd July as it was almost entirely made up of regulars who have made Rynda their own. 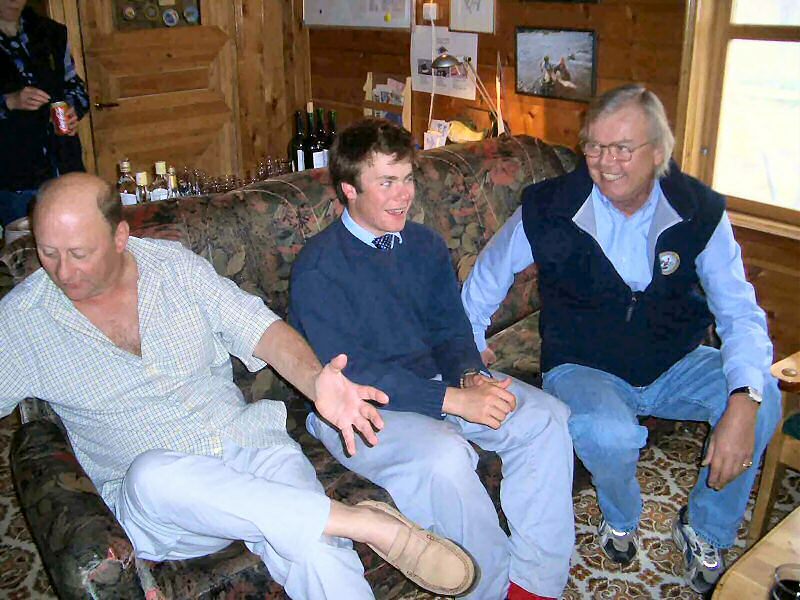 They were charmed by new entrants gentle giant William (6′ 7″) and young Charlie (15) who came with father Nicholas. It rained on and off causing a steady rise of 9″ over the week with the water temperature ranging from 12 to 15C. Being the first substantial water level increase this season it created a certain amount of algae turbidity which tended to put fish down or take short and there were not many big fish in evidence. Not withstanding this it was splendid fishing with 120 salmon landed. 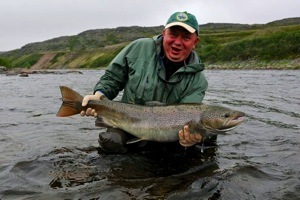 The best news was that Zolotaya came in to its own with a rise of nice clean water yielding 28 fish to the rods. 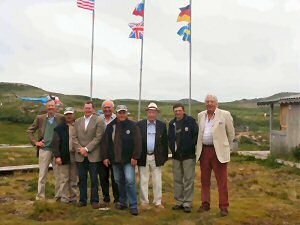 A very lucky team of rods arrived on 30th July lead by Adrian D. and composed largely of Piers and his friends. We were pleased to welcome for the first time Noel and his stepson Christian who taken together with returning Adrian T. with his son Will spanned a 56 year age differential. 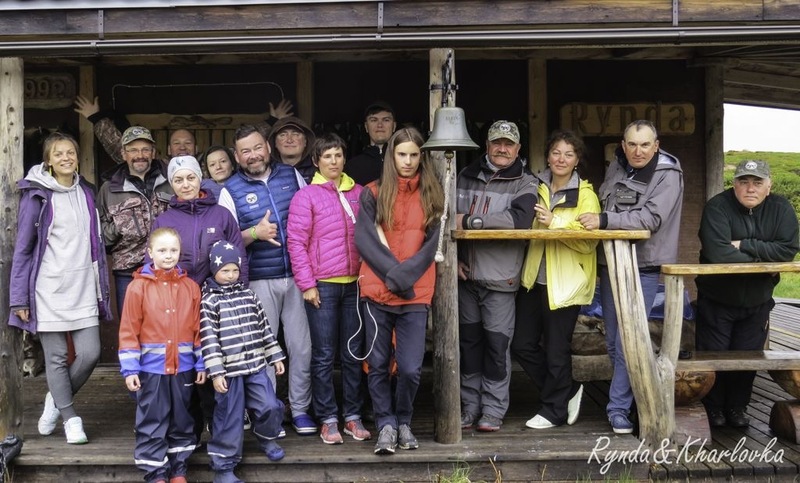 The Rynda staff always enjoy family variety and the party quickly blended together with considerable enthusiasm. 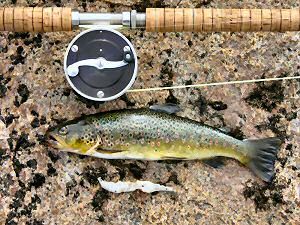 The conditions were perfect and the fishing took off. From the start the water was clean continuing to rise at a nice steady pace finishing up 4.5″ with water temperatures ranging 12/14C. Big fish started to show again and splendid fishing was had by all. 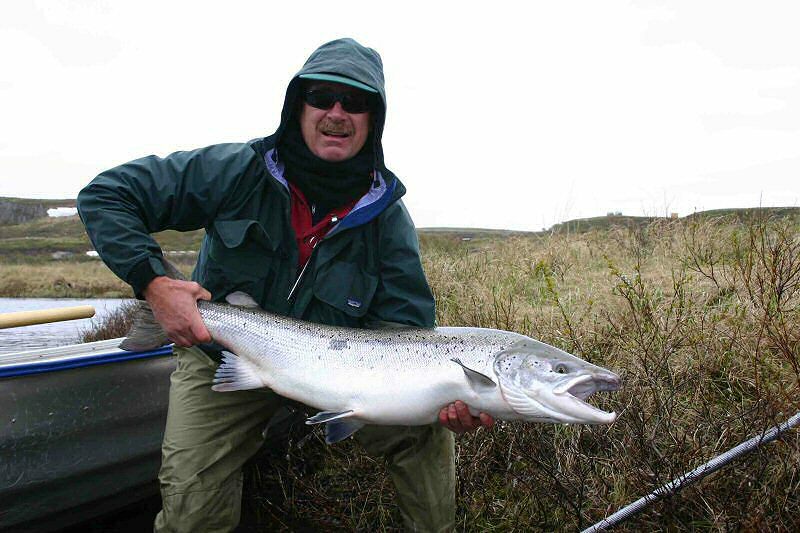 The week finished with a record 166 salmon landed with 8 over 20 lbs and the best at 28 & 26 lbs. With water levels now back at June levels everything looks set for a fine end of season. Now that you have got this far it is strongly recommended that you click on Rynda Flora Gallery above and enjoy the wonderful Rynda flora display by Piers. It will take a little time to come up but you will find it worthwhile. It was bad luck to loose the snow bank in May. The season started on 4-Jun at a water height of only 1.4M on the gauge. It has been quite worrying watching it slip down a little each day until it reached 0.5M on 15-Jul when we had to move it to another location in anticipation of worse to come. It turns out we were unnecessarily pessimistic because the low for the year occurred two days later at .47M which is a fall of 36 inches from the start of the season. From that moment on, apart from a couple of hot sunny days, it has been threatening to rain or actually raining some of the time. It did not do us that much good last week but now on Wednesday, 27-Jul, we are up to .62M which is a 6 inch rise on the low. This is just what was needed and, with water temperature today at about 16C, we may see some good fishing. If you read the Kharlovka reports you will note much higher fluctuations in water level which stirs up the algae and dried out puddles making the water dirty and the fish inactive. Here at Rynda we are blessed with a vast lake system that attenuates the water causing gentle variations and sustain or improved fishing. We predict good fishing water for some time to come. Up to now we have been one beat down due to the low water at Zolotaya. At the end of last week one of us went over for an afternoon and took 6 fish in three hours up to 15 lbs. Those fish discussed in a previous report are now active and joined by others. You will have to wait for the next report to hear of the inevitable bonanza. 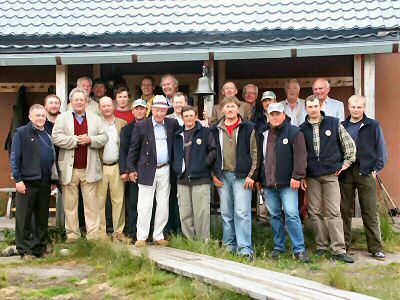 On Saturday, 18-Jun-05, we were in a high state of residence expecting to receive 13 guests including, amongst other members, no less than four ex-Presidents of the Flyfishers’ Club in London. It was not our lucky day. Sadly we were one down at the start with Roger’s visa problems leaving John, Christopher and Michael to do the honours. 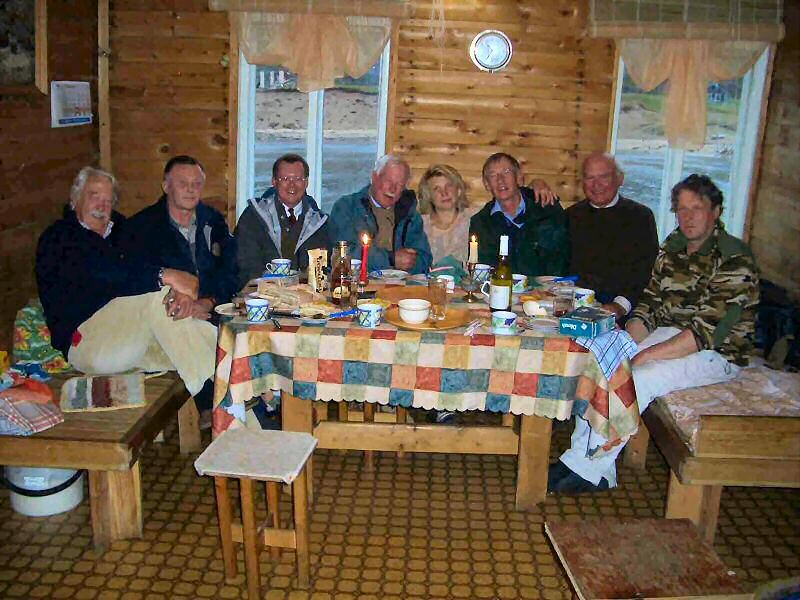 Everyone enjoyed there visit, they were excellent fishers and had a jolly good time. 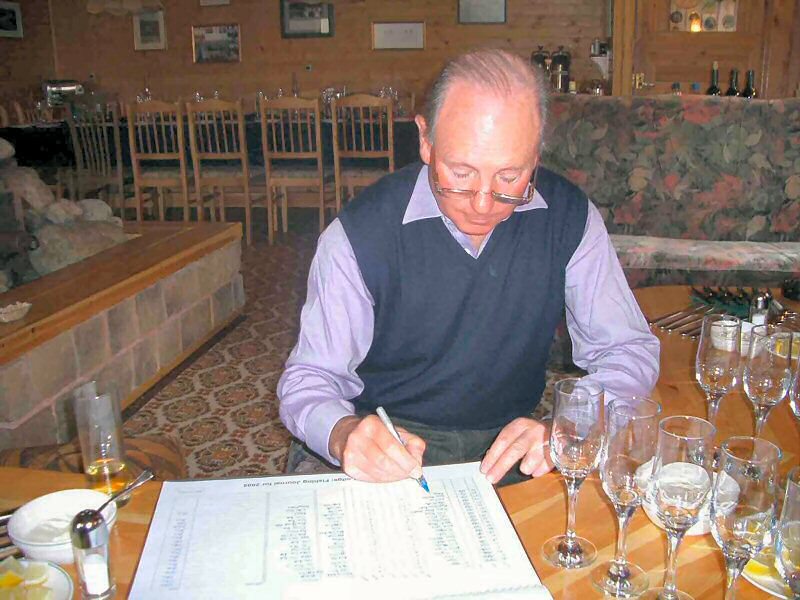 We are delighted to know that Roger will be coming next season when we will make him especially welcome. Indeed it would be nice if he brought some Flyfishers’ with him. Then we learnt that James H., an old friend from Brora days, with his delightful 19 year old son Tom had their flight cancelled by BA. We managed to rescue them by MI-2 from a military track road at 03:00 Sunday morning. Finally dear Chris had his passport, money and credit cards nicked at Murmansk Airport. After a little string pulling here and there all was resolved and he had an enjoyable trip home over the weekend through St Petersburg to the envy of his friends. Not withstanding these diversions the party settled down very quickly and a great time was had by all. 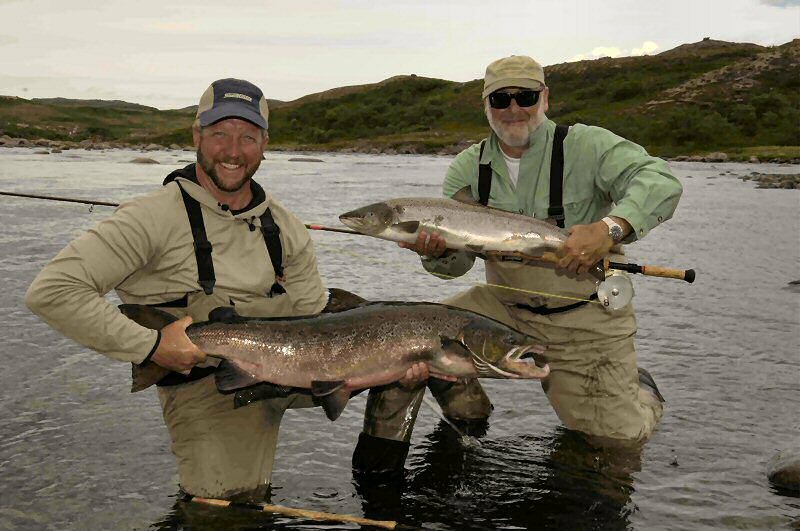 We managed to land 125 fish after the intrepid Andrew added a couple from another of is Upper Zolotaya expeditions. 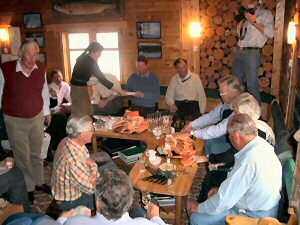 This was a good showing since such gentleman of leisure do not fish after dinner when there is good food, wine and conversation to be had. 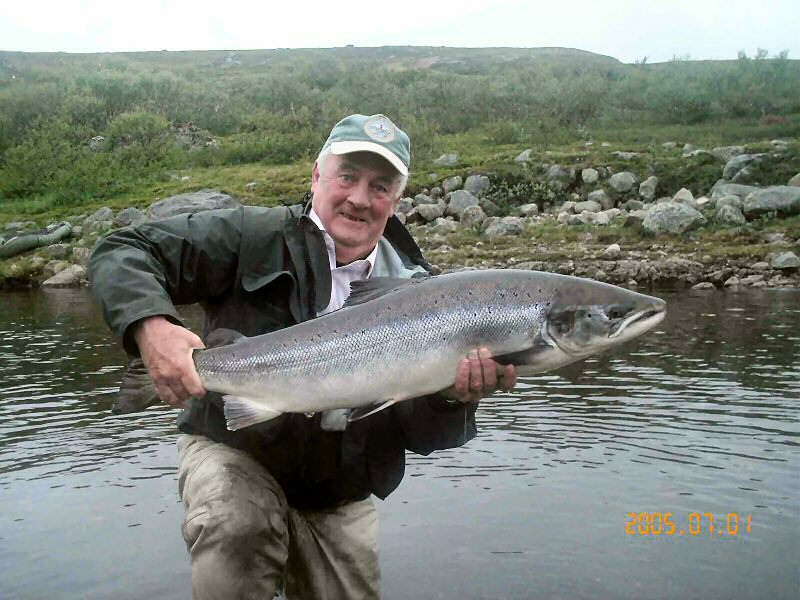 This left the field open for Tom who delighted us all taking his first three salmon on Sunday night and going on break his record several times with his best at 23 & 21 lbs both in Tolstoi last Thursday. Needless to say father James was close behind when he had time to fish after enjoying his son. The week was particularly pleasant because James F. also brought along his 17 year old son Devin who also took his first salmon. 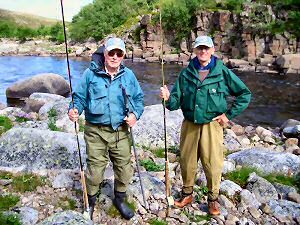 Father and son teams are quite the most enjoyable pairs to fish in any party because they remind us of what is important in life. Our two Doctor guests, Julian & Simon, did well for their first time Simon landing a 23 & 20 lbs fish. 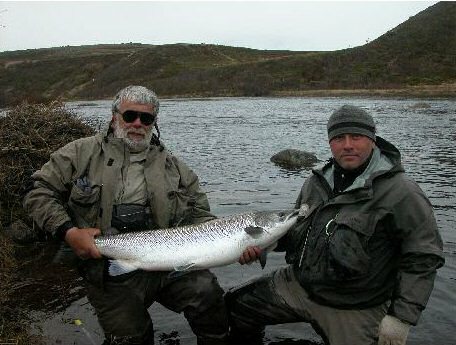 Lars, an old friend from Norway, took the largest fish of the week at 26 lbs again from Tolstoi. We all admired the way he kept going despite obvious physical discomfort and were really pleased to see him beat his record. He was partnered with Roy of Roy’s Bath fame and of course this meant Venya as the guide. We were all expecting another mad dash after an enormous salmon down some impossible piece of water but it was not be this season. We suspect his efforts were slightly curtailed by a business distraction resulting in clear breach of Camp Rule No.1 and late in the week it is possible it at least crossed his mind to attempt a breach of Camp Rule No.2. without wearing a life jacket. 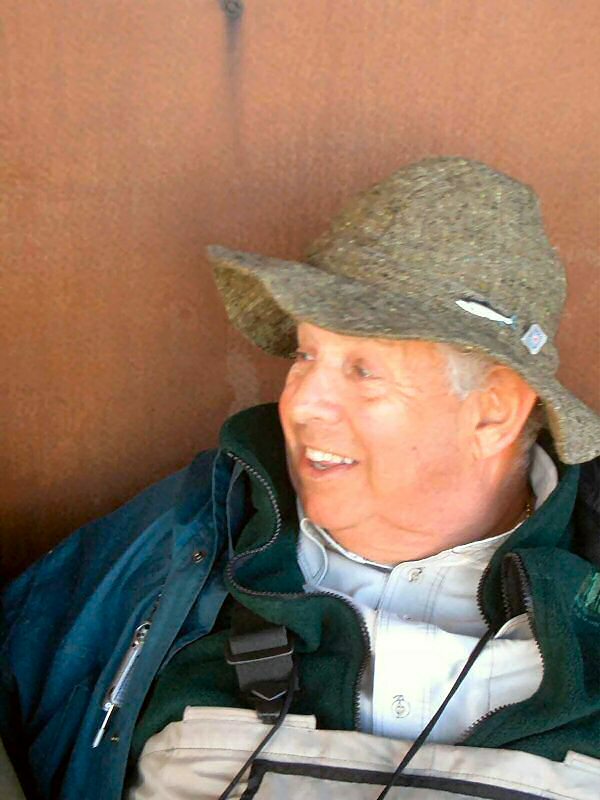 The highlight of the week was Chris R’s 70th birthday party last Thursday. Obviously the first thing to do was to send him off fishing from whence he returned beaming with tales of landing three fish up to 11lbs and a monster lost. Then we had a pleasant drinks party at Rynda House followed by a truly decadent crab eating session at the lodge. 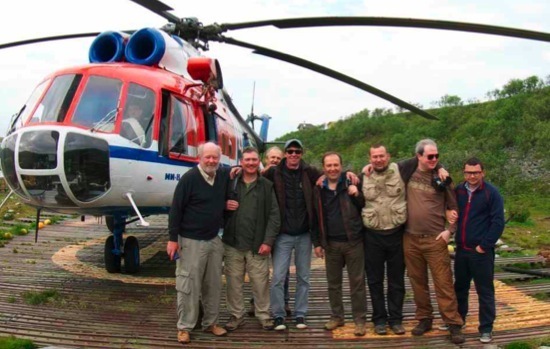 Dinner was served as usual until just before pudding when Fly Fishers’ members were asked to leave and join Sasha & Kola Lite in the MI-2 helicopter. 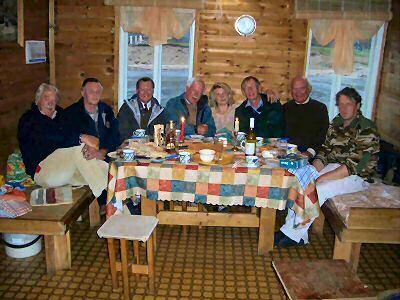 Down at Rynda Old Village they were received by Taisa and Nikolai Nikitin where they enjoyed a splendid cake with ice cream together with red wine and brandy of dubious origin. In total last week we caught 152 fish just a few more than last year. It was a fine achievement with five over 20 lbs and the two best at 28 lbs. 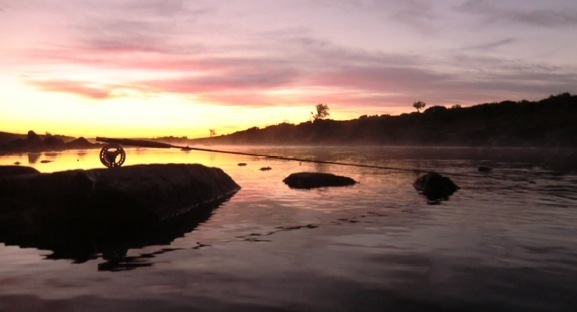 It got quite warm at the beginning of the week but fortunately the AM water temperature never rose above 18.5C. There has been a bit of rain and the river height has been quite stable these last few days. There are still plenty of fresh fish coming in with some caught in the middle reaches of up to 15 lbs with sea lice. We hope it will stay cool and we will get some meaningful rain. It was another splendid week with old friends this time joined by James and Christopher to add “youth and skill” to “age and treachery” together with Anthony who lies somewhere in between. They all did well for first timers and were an excellent foil to the rest of us who have been coming for so many years. Christopher broke his record with a 21 lbs fish from Peter’s Pocket. One of the delights of Rynda is that it really does favour those who have favoured it. Take Hugo who has been coming since square one. After God knows how many heart bypasses he is really getting into his stride with ever increasing numbers of fish and this year had his best ever from Tolstoi. He and Guy with son John had a fine time together with no less than three guides to keep them on the job and out of trouble. 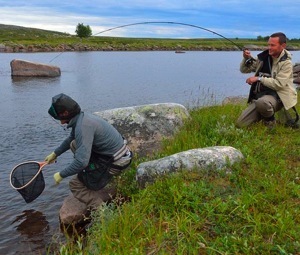 Tim and Andy, experienced Kharlovka hands, seemed to be fascinated by the complexity of the Rynda and fished enthusiastically all week. Tim landed a serious fish from Tolstoi at 28 lbs. 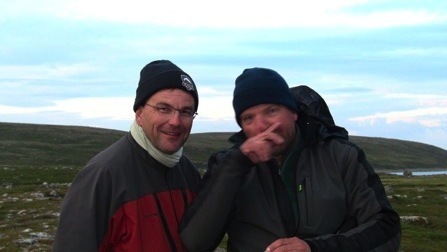 David and Mark were back again and had a most enjoyable week together not that we could see all of Mark who, in his usual elegant attire, struck a “natty” figure under his enormous head net. Talking of mosquitoes there is a rather interesting theory in relation to reindeer. Sometimes you find them huddled along a mountain side in groups of anything from a hundred to even several thousand. 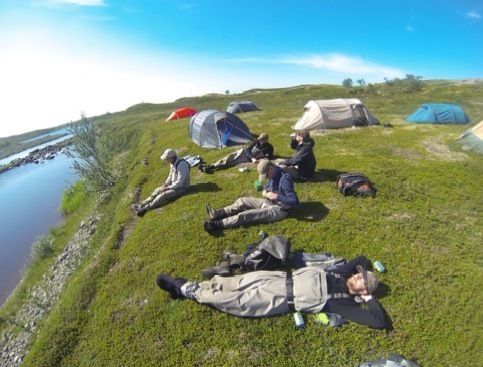 The theory is that for a given area there are a given number of mosquitoes so that if you pack a large number of reindeer, or people for that matter, into this area there are fewer mosquitos to go round. Add to that a mountain side location with maximum airflow and you get relative comfort. Of course eventually the little blighters from the outlying areas will figure it all out or the wind will change and you have to move to another place. Actually this year has been rather cool and we have not been bothered too much. 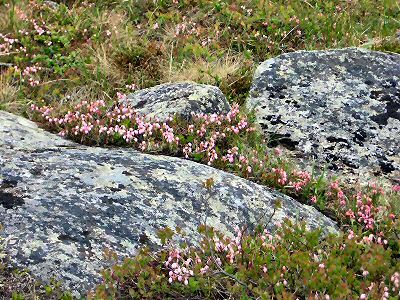 It was a notable week on the nature front because Piers has given the lodge a printed version of his Powerpoint presentation on the flora of the Rynda Tundra. It is a comprehensive botanical work covering three seasons and makes beautiful reading because his scientific descriptions under superb photographs relate to places along the anglers path evoking memories and renewed interest in the wonders of nature. Some of his finds are quite rare and there is even the possibility of a new discovery but this is all a bit hush hush. You will just have to be content with the accompanying photograph of Piers in action for the moment meanwhile watch this space because with any luck he will have arranged for you to see his presentation on this web page in the near future. 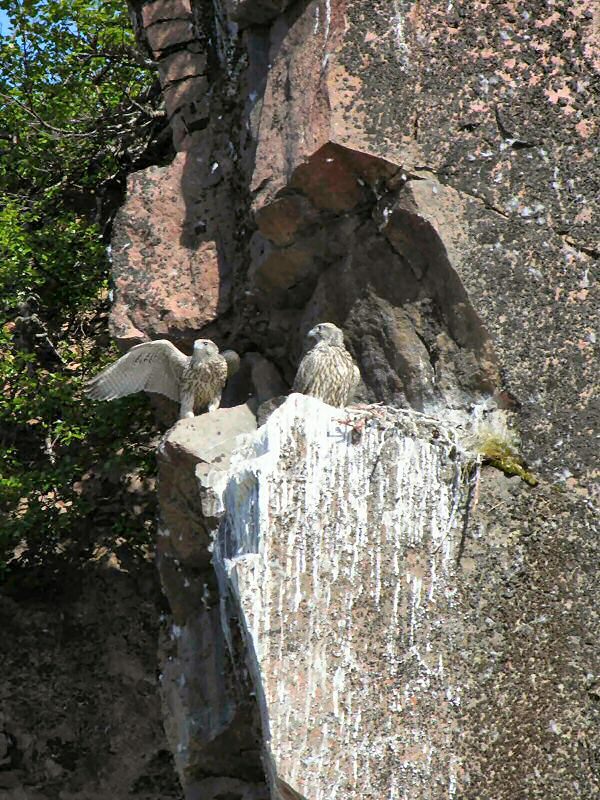 You will be pleased to hear that the Black Cliff eyrie was indeed that of a pair of Gyr Falcons and the two fledglings have safely taken flight. 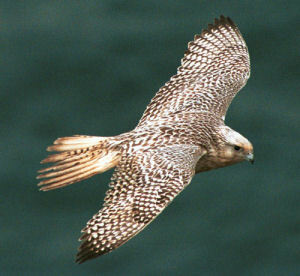 Now here is a story about the mother Gyr which bares no exaggeration. 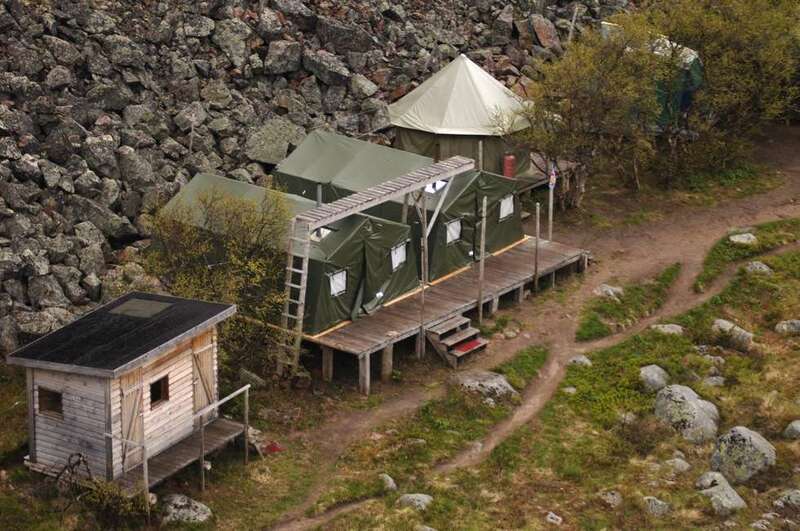 Last Thursday a Ptarmigan flew passed Rynda House straight down the middle of the camp. Piers and Anthony were standing outside Cabin 3 opposite the Lodge entrance where Yours Truly was standing. 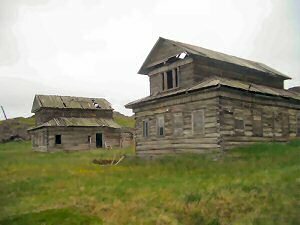 Suddenly there was a whoosh and flurry and the Gyr stooped on the Ptarmigan and the pair of them collided with the open door of Cabin 3. 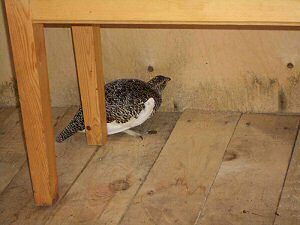 The Gyr landed at the flag poles and, meanwhile, the Ptarmigan had the presence of mind to sneak into the cabin to avoid further harassment where it was duly photographed by Anthony. Meanwhile the Gyr took a few moments to recover and then quietly soared away over the Winter House. Nico, Sue, Tim and Andy came to us after a week at Kharlovka. Sue has summed it up rather nicely in her charming letter: “we had the best fortnight ever – truly – I can’t pin point exactly why – your Russians – our fellow guests – the ever fascinating water – I certainly did not catch many fish on the Kharlovka, loosing them with extraordinary regularity but still had a wonderful time, especially enjoying going above the waterfall to Kharlovka Park for the first time and had a particularly happy day with Justin on the Litsa – and everything ran like clockwork as always, a great deal of good humour and friendliness and the magic of the tundra. The happiest weeks are all about people in harmony with nature – Staff and Guests alike. 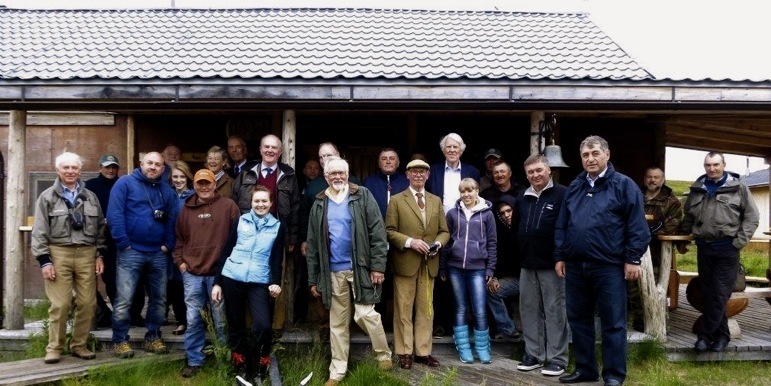 The Atlantic Salmon Reserve provides some of the finest fishing in the world but as someone said at the Flyfishers’ Club one evening: “If you go there just to fish I feel truly sorry for you”. Considering the low water condition we have been very fortunate these last 10 days or so because the daily air temperature has been quite cool for this time of the year and falling to 2/5C at night. This has kept the river at around 10C. You may recall it was up to 18C in 2004. This is important for those of you coming later it is holding both fish and algae back. The result has been good fishing during the day below the power line although the keen after dinner anglers have had a more difficult time. There was a Scottish gillie on the Tay at Church Pool who used to say it was not worth starting in the morning until the mist was off the water. The other night there were large numbers of fish showing all over the place so a few of us went out late but with limited success because the water was actually 10C higher than the air. Last week was a great house party of old friends joined by one “new boy” Richard who we all thought “survived” superbly. 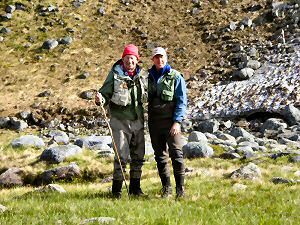 Many of them found it the most enjoyable of their 5/6 years here and were fascinated to fish what is a completely different river to what they are used to. For them new pools were discovered and new techniques applied. We landed 129 fish in total last week (just a few more than last year) which was a fine achievement because Zolotaya has only been able to make a small contribution. Currently we are 11% up for season. We opened the champagne for Anthony over his best ever salmon of 23 lbs taken in the Lower Canyon. 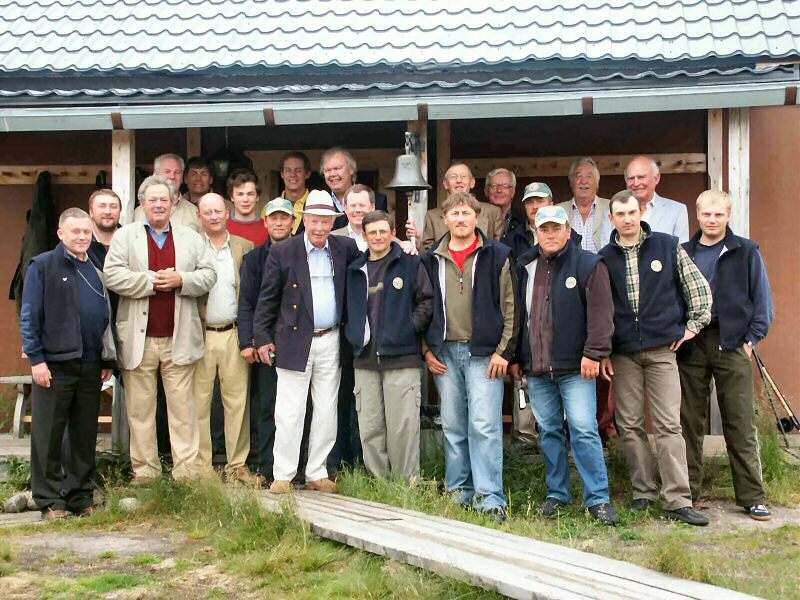 He was particularly chuffed because it was taken on the Prince of Wales fly created by Don Downs to mark the occasion of HRH’s visit as Patron to the Flyfishers’ Club on the 9th June 2005. The photograph does not really to it justice but in fact it is an ideal fly for Rynda with its blue, yellow and gold. Normally we would not fish Black Cliff until August but this year it has been turned into a hot spot by Maurice who managed to get his leader broken no less than three times with big fish encounters. Meanwhile Adrian discovered what appears to be a Peregrine Falcons eyrie with two fledglings in the Black Cliff itself. 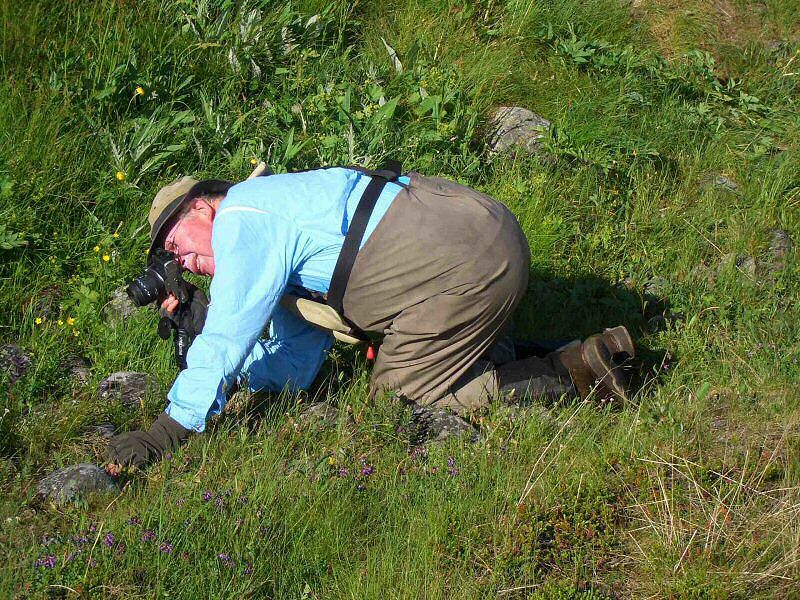 He took some wonderful photographs by telescopic lens without disturbing the site. 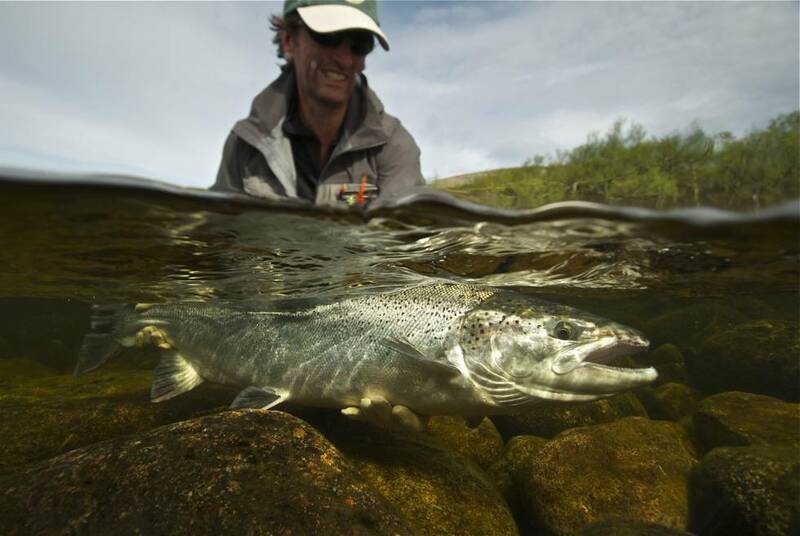 The scientists tell us that 90% of the spawning ground for salmon in the Rynda is between Reindeer and Sea Pool. There seem to be ever increasing numbers of parr and smolts and in this low water with small flies we have been hooking an uncomfortably large number of them. In addition we are disturbed by the number of large Brown Trout being caught some if which regurgitate our juvenile salmon stocks. The policy has always been barbless hooks but this has not been rigidly enforced. By general agreement guides will in future automatically de-barb all flies and guests are asked not to fish the shallows where the juveniles concentrate as advised by the guides. In addition we have reluctantly decided to kill all sizeable Brown Trout in the salmon stretch. 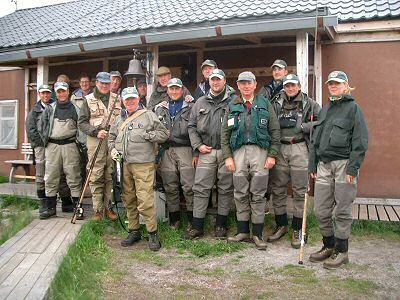 Zolotaya is the source of special joy and many insist on a day out for the simple pleasure of being there in addition the prospect of a fish or two. This year we have only taken about 50 fish as against 100/150 in prior years. The river is short, its headwaters are at a fairly low elevation and it is not supported by a vast lake system like Rynda. Yesterday was the first really hot bright sunny day (Not repeated today thank God!) so we decided to do a helicopter survey of salmon stocks in the Zolotaya at high tide. There was nothing at the river mouth and the main body of the estuary. Then suddenly we were stunned to see 150/200 salmon a grilse congregating about 200 metres below Sea Pool and then another 50 or so in the Pool itself. Several fish were seen negotiating their way to Five Stones but there was only one in the Pool. We were amazed at the number of fish we spooked in the first rapids but then surprised to find nothing in Long Pool. More salmon were scattered about the Long Stretch and about 10 were seen in Banks Corner. In the main lie of Russian Pool there were only two but then a large black pod exploded in the upper section revealing 50 or so with 20 pounders amongst them. Again there was fish movement in the second rapid and a dozen or so in the channel at the top. There must be up to 500 fish between the sea and the lake right now. At this point we quit and went up to Peter’s Pool to fish. We immediately caught one and lost two and the pool went dead. 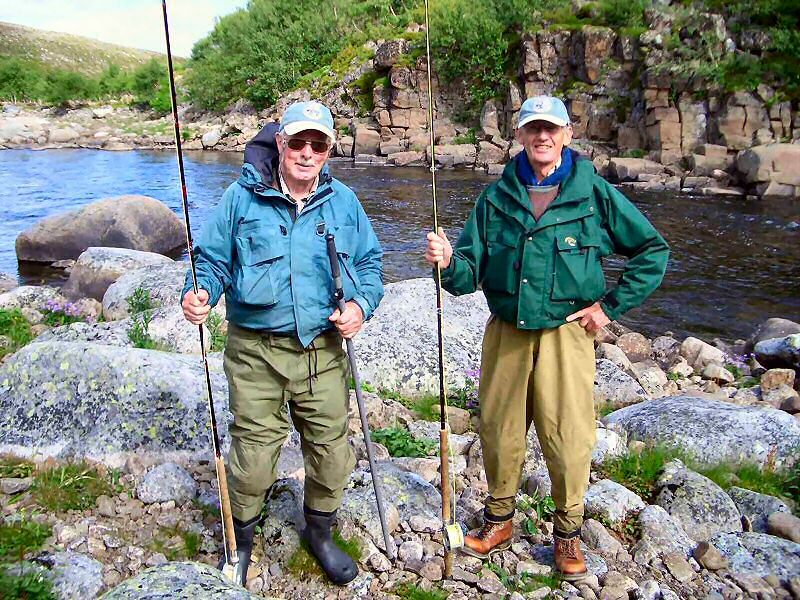 Both Rupert and Jeremy were almost impossible to fish so we went down to Russian Pool. By standing well back and casting a long line a fish was immediately taken and then the pool went dead again. Down we went to Sea Pool to fish at low tide but even then there was virtually no flow for the fly to work. After stripping away we waded into the pool convinced they had gone back with the tide. Not so – They were all there right at our feet. So with Zolotaya we will just have to pray for early rain which is forecast. Meanwhile some of us will just wander down this beautiful place trying here and there and being in heaven just the same. Some, like Piers, Lawrence and Elizabeth, will discover a new flower and rejoice at the wonder of nature. 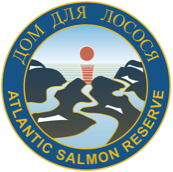 Always remember the Atlantic Salmon Reserve is a big chunk of the last remaining tundra in Europe. 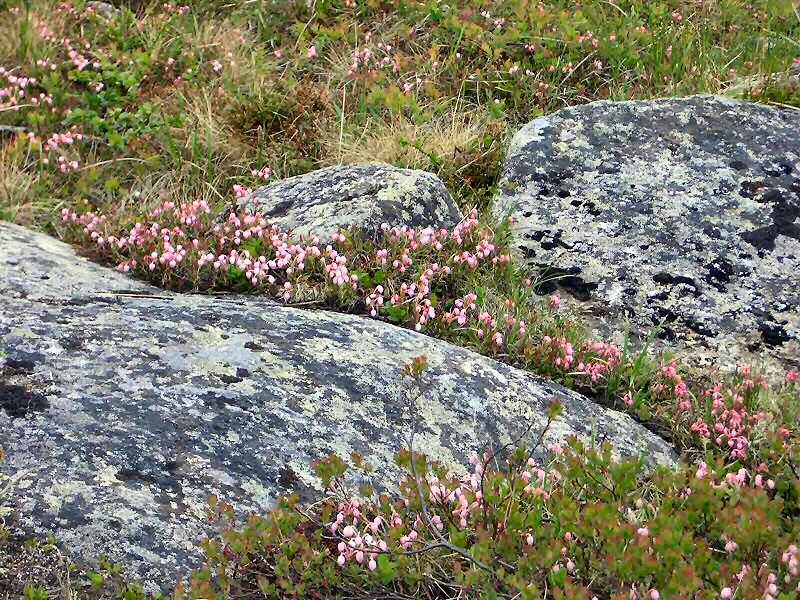 It is an exemplar of the first biome, the first interaction of flora and fauna, after the last ice age 8000 years ago. One learns to be quietly amused when asked to forecast weather in the Arctic. Even in the same day it can start off gloomy at 5C and end in sunshine approaching 20C. There is no such thing as a reliable forecast. 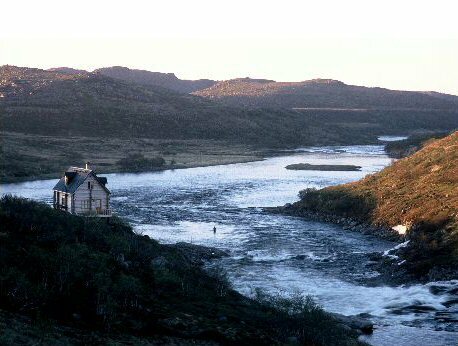 When the river is low such as now the water temperature could shift by nearly 5C in a day. Arctic weather is hopelessly unpredictable. It is probably the same way in the Antarctic. As to a season consider this: In this week the guests arrived to 7C in the air & 10.3C in the water as against 25C & 16.7C last season. The water height is about what one would expect at the beginning of August. For some time we have awakened to air temperatures of 5/7C and the water temperature was only 11.2C last night. If it were a little warmer it would improve the fishing for now to the detriment of fishing later. We pray for a cool summer to keep the algae at bay and then the Rynda will fish through. 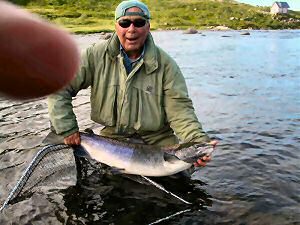 Yesterday Maurice was broken three times at Black Cliff which would not normally fish until August and Anthony broke his record for the third time at Rynda with a sea liced fish of 23 lbs from the Canyon. 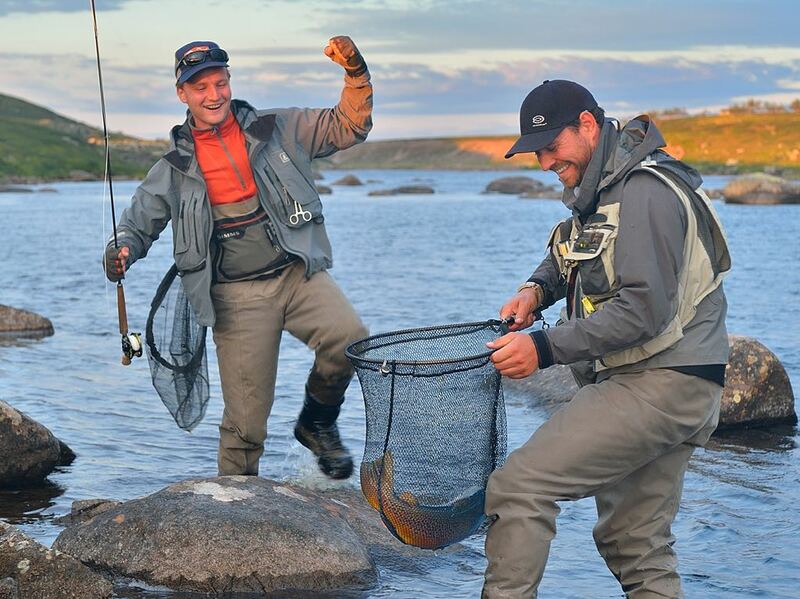 It is great fun for the guests because they are fishing in pools they never new existed. They are exercising all their fishing skills instead of casting merrily away into deeper water. 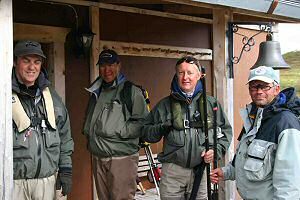 Everyone is listening to the guides with special attention this year because they know all about low water conditions and for those of you coming in future weeks do remember to read up Gordon’s piece on the website headed “Low Water Fishing” in the directory. Last week was exceptionally enjoyable. It is the week that was started of by Mike Savage years ago and everyone has been here up to six times so Rynda is something of a second home. There is much talk of the “best week of our year” and all the staff take great pleasure in looking after them. Of course they know the river backwards and do well with the fishing. 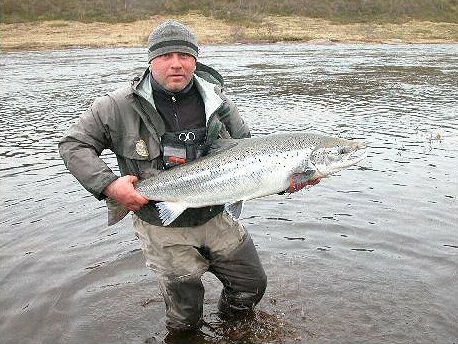 They landed 146 salmon from Reindeer to Sea Pool with three of 26 lbs. So far this season the results are about 15% better than last season. As most of you know Rynda is operated under a variety of environmental rules which largely come down to “Don’t damage or interfere with nature”. The keystone rock in the Home Pool weighing maybe 10 tons is a classic example. Nearly everyone has considered the possibility of blowing it up. With ex miner Vassili of Litza to hand with a stick of dynamite it would be so easy to do. Of course we never will because there is no end to that sort of thinking and one never knows the consequences of such potential actions. Home Pool is what it is – As created by 1000 metres of ice about 8,000 years ago and then worn into its present state by the ravages of extreme cold and raging torrents. It is highly complex to fish properly. The best lie for a big fish is just to the right of the keystone. 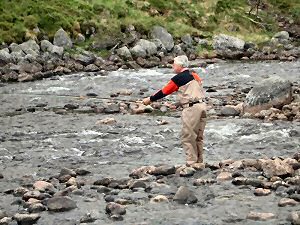 It is difficult to get the fly to work properly from the left bank and a long cast from the right over the left shoulder that is not everyone’s best. It would seem Ollie got it just right last week by slipping out to fish this lie after dinner at the end of the week to triumph with his best ever at 26 lbs. It was a moment of supreme joy for all us. Thank you all so much for cooperating over the problem of baggage weight. This next Week 28 starting 9-Jul-05 is another extremely difficult flight but thereafter things settle down with reduced numbers of passengers. Please accept the most sincere apology for this dreadful blunder – It will not happen again. We have always tried to take pride in attention to detail and are most uncomfortable about causing you such difficulty. Do remember the laundry service is over the top when you do your packing. Every now and again we get a little crisis here which we quietly overcome. Sometimes it can all get a bit tedious such as when, two weeks ago, the computer simply went dead. Happily it is now returned from the UK with all information intact so that it is possible to catch up on events. Nico and Roy may now relax in the knowledge that all is well with us and the fishing. The river is very low for this time of year. It dropped 7.9″ last week and 11.8″ the week before so we are at the height you would normally expect towards the end of July. The snow bank was largely wiped out in the last two weeks of May and it is been warm. The water temperature was up to 14.4C last weekend and we thought things might be getting out of control. However, just as Derek & Graham arrived with the usual mob, cold weather with gloomy skies moved in and the water level has stabilised and the water temperature has fallen to around 10C. Right now the fish, fishing and fishermen are all in excellent form with 35 salmon caught by Sunday night (1.5 days) with the best to Kim at 26 lbs. 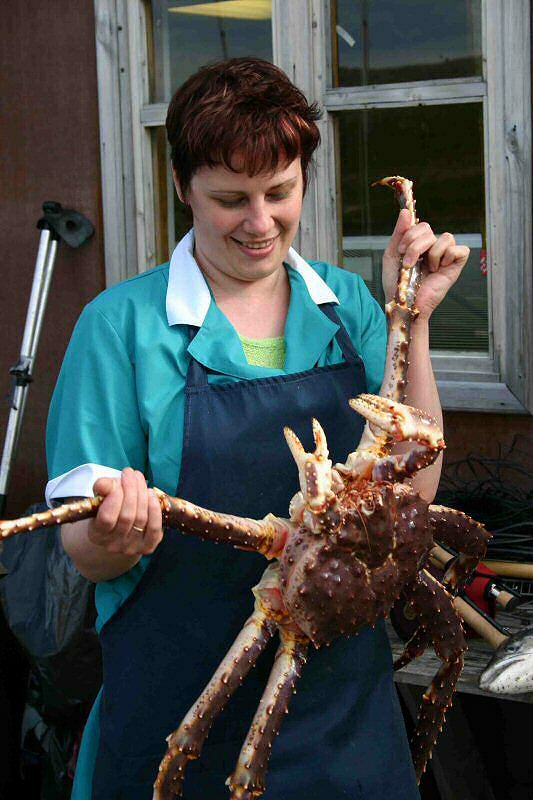 They came in with reports of seeing large numbers of fish moving through the Home Pool and Rock Island and fresh fish with sea lice were caught as far up as Reindeer. Indeed that is the exciting thing. 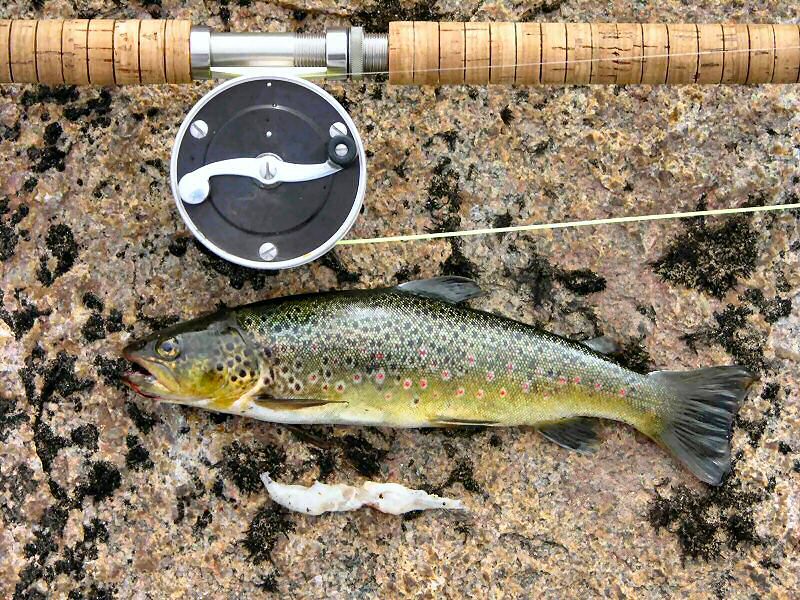 The entire river is fishing well from top to bottom with fresh fish. It is a very special condition. As of last weekend we are 31% up on the same period last year with no less than 5 fish of 30 lbs plus. We had great sport last week with Bill and his ASF friends along with Andrea and Mauro from Italy to remind us that life is damn good fun. There were a lot of laughs and same wonderful fishing. Bill volunteered it was his happiest time here after three years although we all missed Charles. Yvon was in cracking form for his third visit. At one point he was suspected of being in breach of Camp Rule No 2 but all was forgiven because he said he was wearing a life jacket at the time! We were joined by Greg, Jim, Tom and Peter this year. They worked hard and played hard (Camp Rule No 1) and together we caught 110 salmon despite the bright weather. The previous week starting 11-Jun was made up of seasoned Rynda hands. 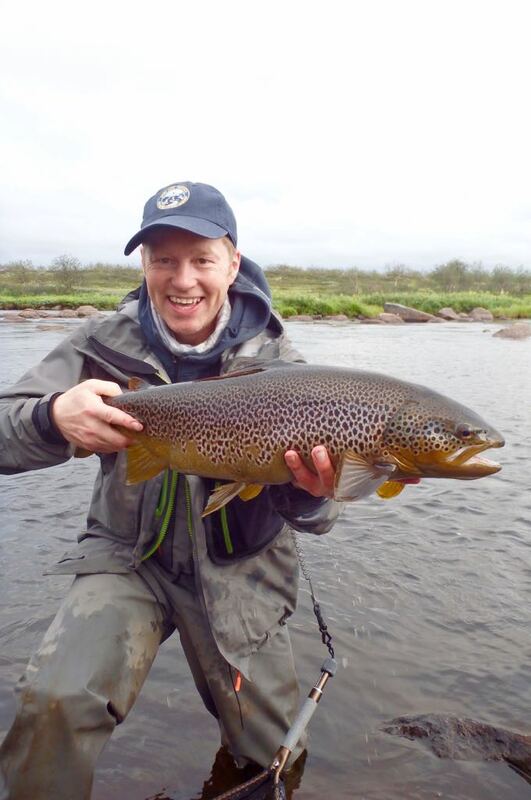 It was a real privilege to be amongst such a high standard of fishing skill. Steve, Way & Bryan from the US, Anders & Thomas from Sweden and Tony, Simon & Gordon from the UK. 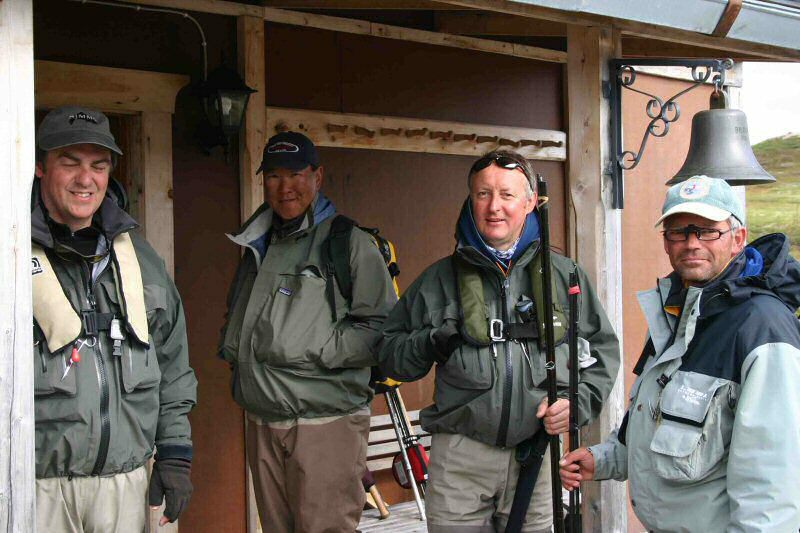 All true Spring anglers searching for the big one in all weather and water conditions. And they found them. 80 beautiful salmon with the best at 33, 31, 31, 30 & 28. Not to be outdone son-in-law Robert, a complete novice, took his first salmon of 12 lbs and he is determined to return for punishment in September. Well there you have it. It is a low water year but Rynda will not let you down. 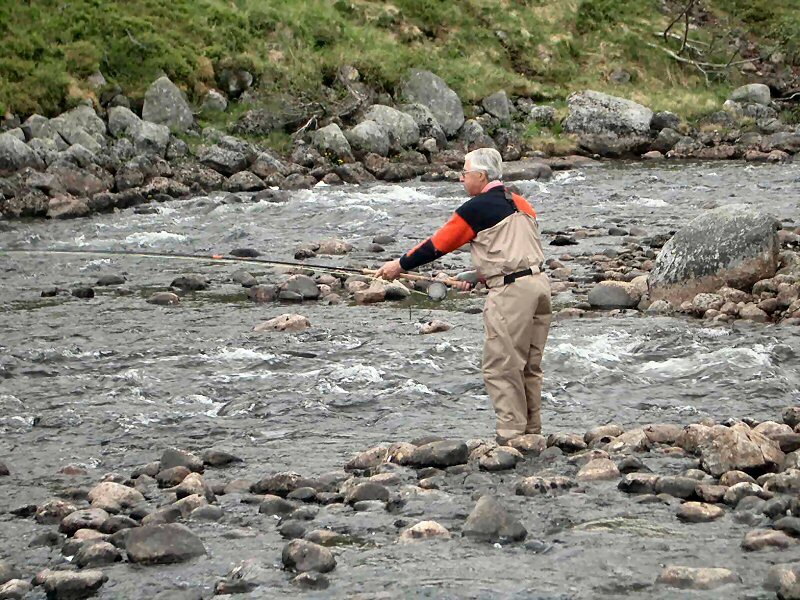 The variety of pools is such that it will fish through the whole season unlike other rivers. Just think of it as a smaller river and enjoy it for what it is. 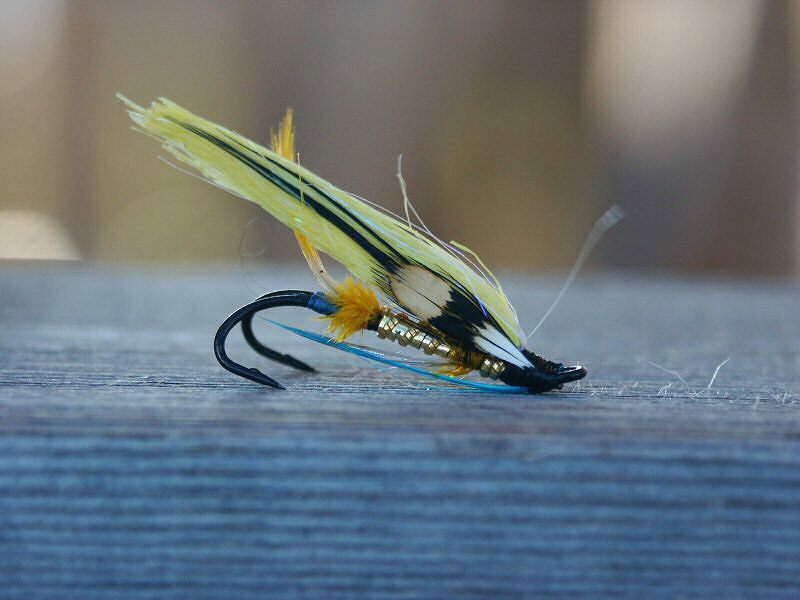 For those of you coming later in the season read up about bombing and skating and bring some of your smaller double handed rods if you have them. 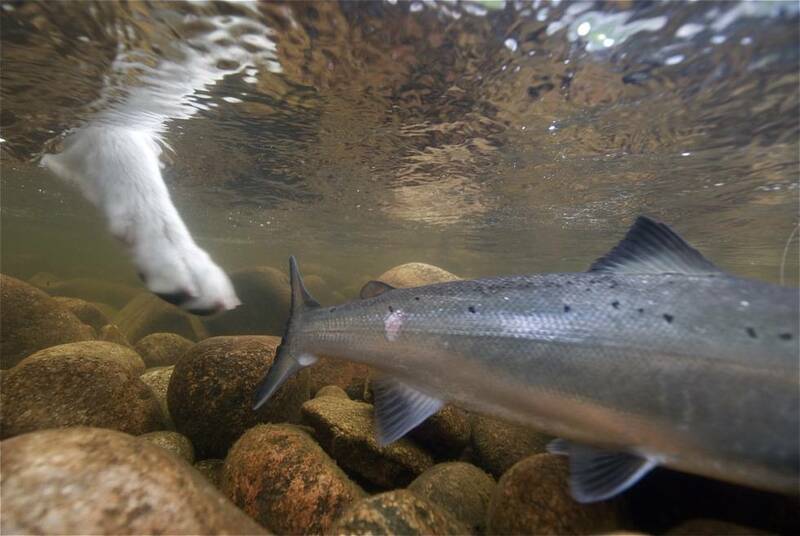 There are plenty of salmon and they will be caught in large numbers. 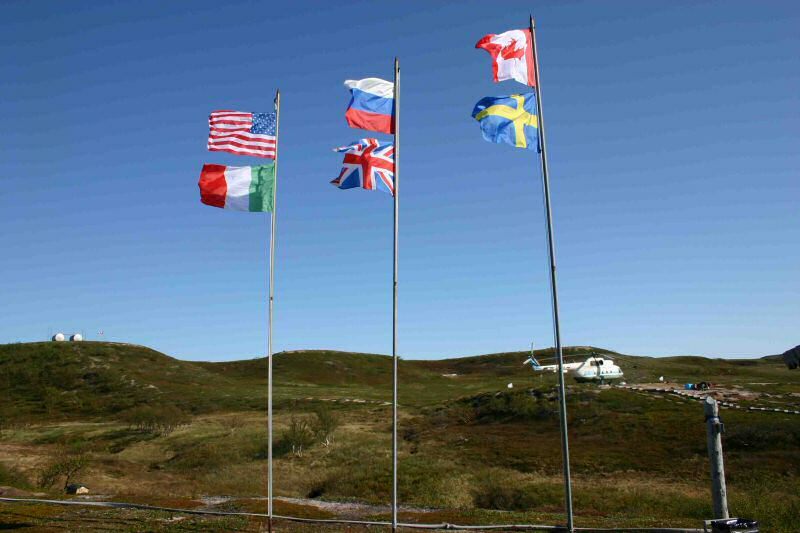 We returned last Saturday to our tundra home at Rynda to start the eighth new season. As we left the Taiga around Murmansk we expected to see a great deal of snow after earlier reports. However the warm weather through most of May had reduced it substantially and there is little more than last year. There is one small point of concern. 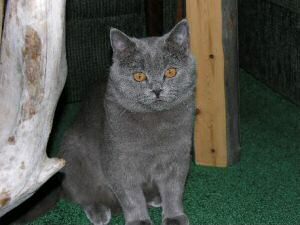 Nina has acquired a beautiful blue/grey cat with large golden eyes named “Bonnechka” (Bonny). It is only six months old and already weighs about 4 kilos which most people, under Plato’s concept of form, think of as cat size. However Nina says that it is still a kitten and in due course of time this creature will grow to be 12 kilos. Some of us are terrified at this idea not least Doc Yury’s spaniel. Who has ever seen a cat of this size other than on Bodmin Moor? The river is coming into perfect condition. It has fallen steadily 4/5 inches these last five days so that one can now freely move about Rock Island. The Home Pool Key Stone is about 4 inches under water with a nice stream flowing alongside the sauna. The morning water temperature has moved up from 4.5C to 7.9C. If this pleasantly mild weather continues we will cross the magic 8.0C mark for the second week starting 11-Jun and the water condition will almost certainly be perfect. Kola thinks we may be fishing “Five Pools” with a week and you can be sure there is the odd monster far up the river. So what of the fishing? Quite simply this is by far the best opening week we have ever had. 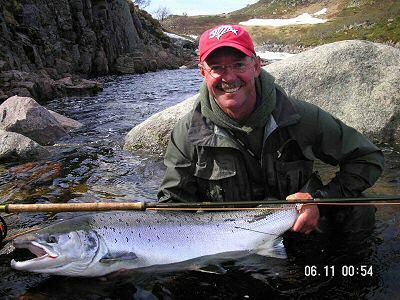 Four good rods have landed 26 salmon averaging a stunning 16.0 lbs. To put this into perspective that is 75% up on last year for the same number of rods. 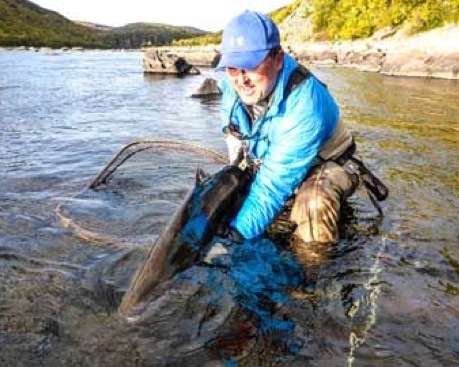 We are confident fish will arrive in increasing numbers over the next few days because as you will read on the Kharlovka page this weekend numbers are dramatically up and Rynda is always a week behind. Way and Steve, our intrepid steel headers from the West Coast, have accounted for most the numbers with their extraordinary casting ability but the Irish soon got into their stride going for size with Gordon landing a sea-liced 20 & 22 lbs followed by Terry with a smashing 31lbs fish from Sea Pool to be followed by Way with a 27 lbs fish from the Croy. 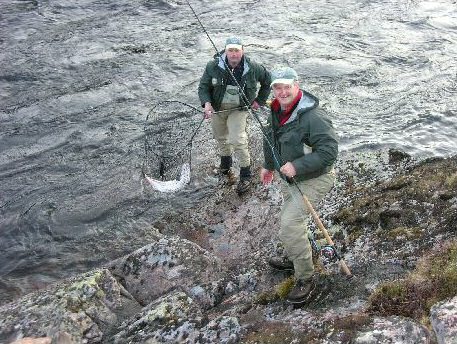 On an afternoon expedition to Zolotaya yesterday Terry landed a 12 lbs fish at the Island below Russian Pool and Gordon lost a good fish in Sea Pool. Later we saw several salmon meandering about the estuary so we should be all set for next week. The first swans and geese have started to arrive and on Wednesday we saw the first reindeer herd of 50 or so. The birch trees were starting to bud on our arrival and next weeks guests will me amazed to see our few trees in full leave. Nikolai says the Eider will hatch this week. He is an expert at the Saamii technique of removing eggs and down in a timely manner so that the birds happily double production. The proceeds are shared on a 50:50 partnership basis between man and duck. He can do the same trick with sea gulls but you get fertilizer instead of down. On crab night he delivered enormous specimens that he thinks will be quite plentiful this year because they were covered in sea lice.